For my best friend’s birthday party, I took it upon myself to make her a beautiful birthday cake. I have recently been absolutely smitten with Smitten Kitchen, and so I decided to use some of her recipes for this cake. 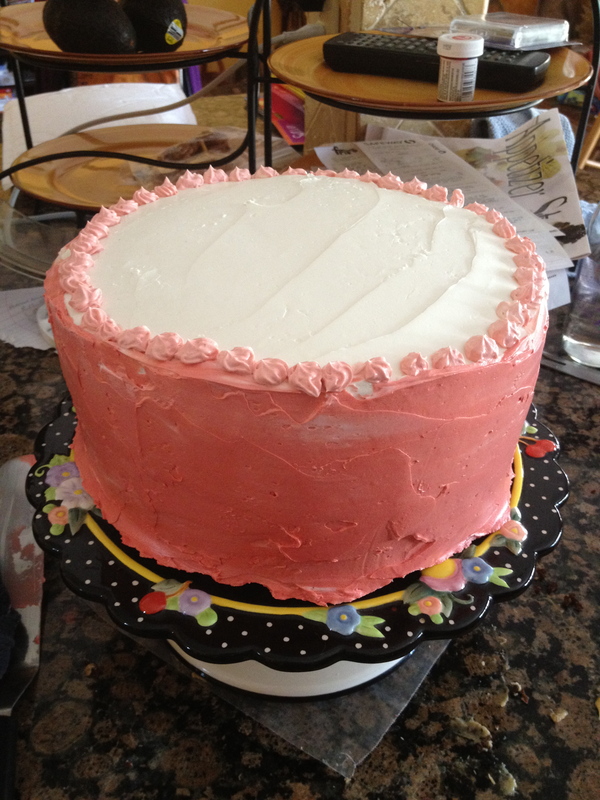 I’m so glad that I read all of her tips on Smitten Kitchen about how to make a cake, because it turned out amazingly. I am really proud, and I feel one step closer to being ready for a wedding cake that I may be making in December! 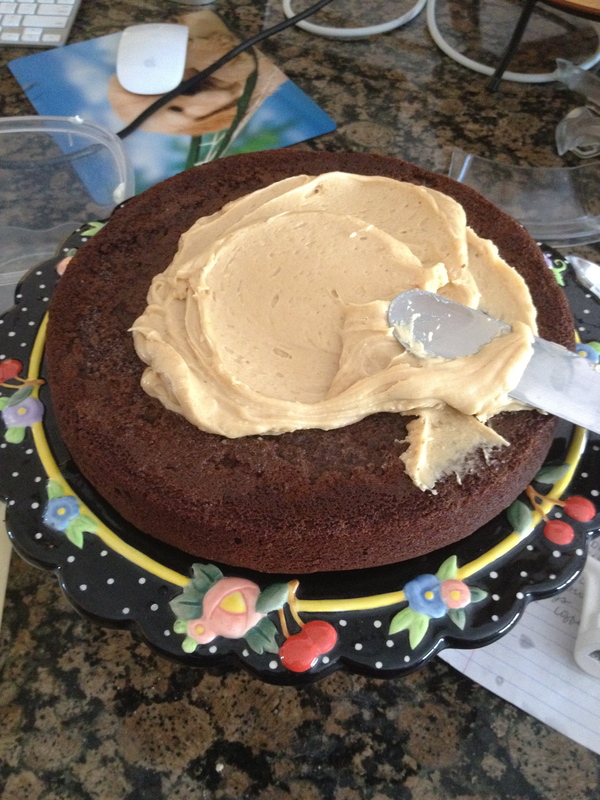 The cake was a decadent and rich chocolate cake, coupled with a peanut butter filling and butter cream frosting. In short, it was to die for. Freshly baked cakes and soon-to-be mini cupcakes from the extra batter! My friends Cat and Alex came over and kept me company/helped to lick some spoons while I baked the cakes. We were lucky that we had just enough cake batter left over to make a few mini cupcakes so that we could taste the cake. Needless to day, these little bites disappeared really quickly. 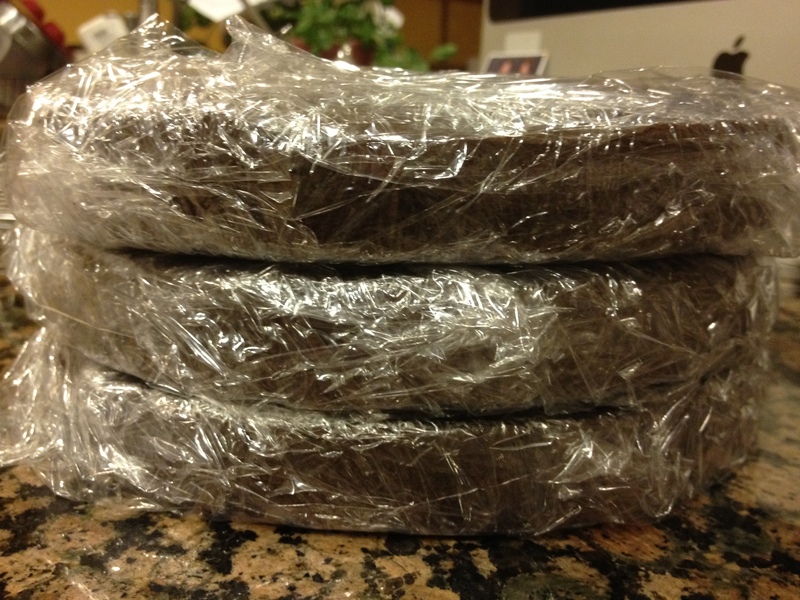 Cakes wrapped in plastic and ready to be frozen! 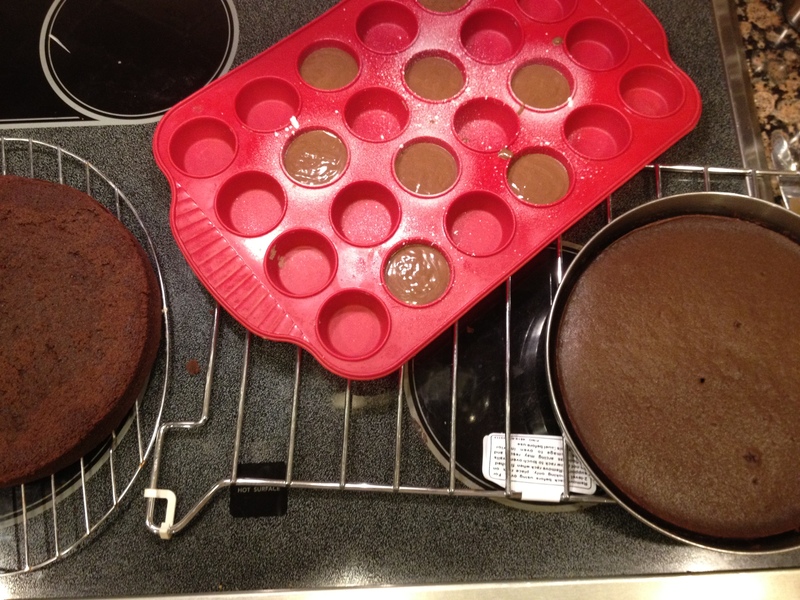 I then placed each cake layer on a cooling rack in the freezer for about a half hour. After they were frozen, I carefully wrapped each cake in 3 layers of plastic wrap, and then wrapped all of them together and placed them back in the freezer. I froze them because a frozen cake is much easier to handle when frosting and stacking than a fresh cake, and the flavor won’t be compromised when the cakes are frozen for a short period of time. In order to replace any moisture lost through freezing, I mixed 1/2 cup water with 1 teaspoon of vanilla extract and brushed it on each cake layer before frosting. Chocolate cake with the peanut butter filling! The frosted cake! Please ignore my messy kitchen..
Chocolate Cake with Peanut Butter Filling and Buttercream Frosting! As usual, I am really impressed with Deb’s recipes. You can find the links below, after the recipe that I used for the peanut butter filling. Although I cannot claim responsibility for how delicious this cake was, I can tell you that the cake recipe itself was super easy and only uses one bowl. With the help of a fancy kitchenaid mixer that was lent to me, the butter cream frosting came together nicely as well. In that recipe, Deb emphasizes to not freak out and that it will come together eventually. Just as I was about to freak out, I consulted the recipe again. 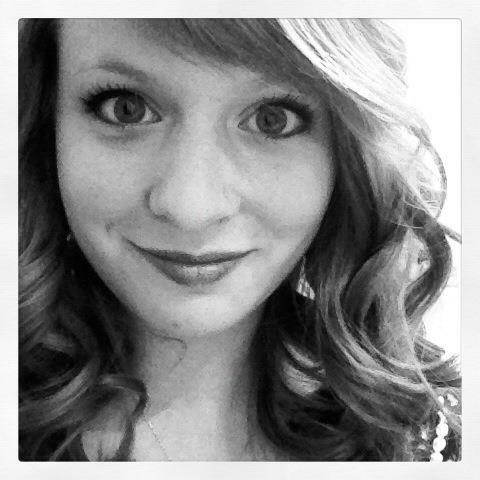 When I looked back down at the mixer, it had come together beautifully (to my amazement, and great relief). This frosting changed my life. Not only is it relatively easy, but it is dangerously delicious. I seriously wanted to eat it with a spoon- it tastes similar to real whipped cream, only better if that is even possible. Its like a cloud of smooth sweetness… I could go on forever. 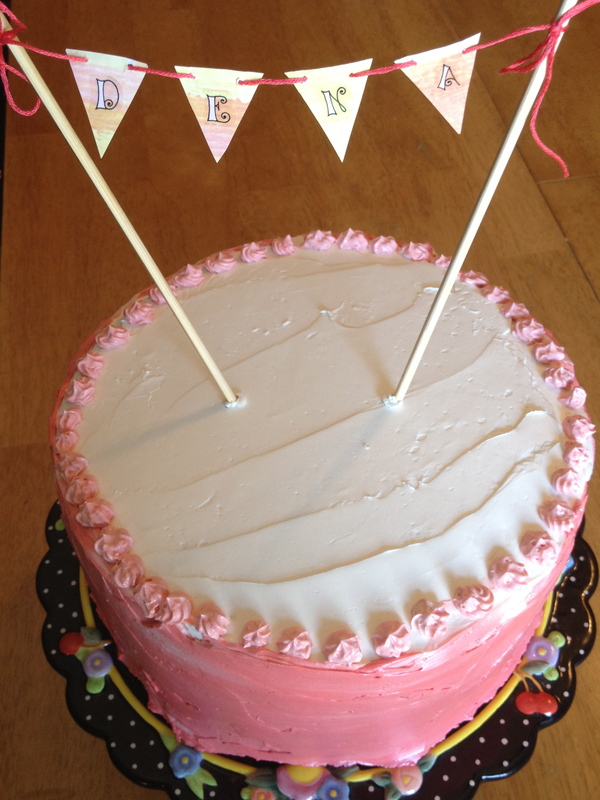 Thank you to Deb at Smitten Kitchen for having such a wonderful blog with so many details. Happy Birthday Dena! Beat butter and peanut butter together. Mix in the sugar in 1/2 cup installations. Add the milk slowly, you may not need the entire 1/2 cup. Once the mixture is completely moistened, beat for 2-3 minutes. Combine the sugar and egg whites in a large metal bowl. Place over a pan of simmering water and whisk until the sugar granules dissolve. Remove the bowl from the pan onto a dish towel and dry the bottom of the bowl. Transfer the egg whites to your mixer and whip until it turns white and doubles in size. Add the vanilla and mix. Lastly, add the butter one stick at a time and whip constantly until it becomes fluffy. Do not fret- just keep mixing!! Preheat oven to 300 degrees F. Butter 9 inch round cake pans. Cut a piece of parchment paper to fit the bottom of the pan and press it down on the butter. Butter the parchment paper as well. In a large bowl, combine the flour, sugar, cocoa powder, baking soda, cinnamon, and salt. Mix together with an electric mixer. Add the buttermilk and then the butter, and mix on low until it is combined. Then raise the speed and beat for 2 or 3 minutes until it is fluffy. In a separate bowl, mix together the eggs and water (or coffee). Add in to the batter in 4 parts, mixing carefully to not splash anything around. Once combined, take a moment to admire the amazing consistency, and then split the batter among your cake pans (or put 1/3 of it into one pan, if you only have one). Bake on the middle rack for about 40 minutes, rotating halfway through, until a toothpick inserted in the middle of the cake comes out clean. Remove the cake from the pan onto a cooling rack and freeze for 30 minutes. Wrap in plastic wrap and return to freezer. Repeat with each layer of the cake. What is the nicest treat you have ever made for someone on their birthday? 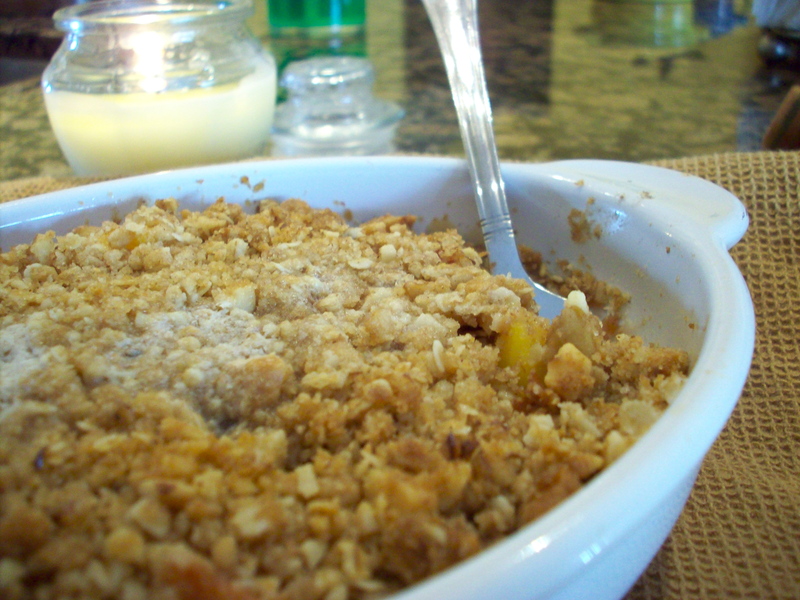 An easy fruit crumble that’s perfect for breakfast or a healthy dessert! This morning I really wanted to have a nice breakfast, and a sweet cumble just seemed to be calling my name. More simple than a cobbler, this was the perfect fancy breakfast option to suit my tastes. The texture of baked stone fruits is divine; I swear they were just meant to be baked into pies, crumbles, tartlettes.. you name it! We are lucky that we can find most stone fruits year round, but they are best when in season. Nothing compares to a juicy, plump peach or pluot. Making this recipe with my Mom inspired so much excitement for the holidays, I can’t wait to cook with her and my family. 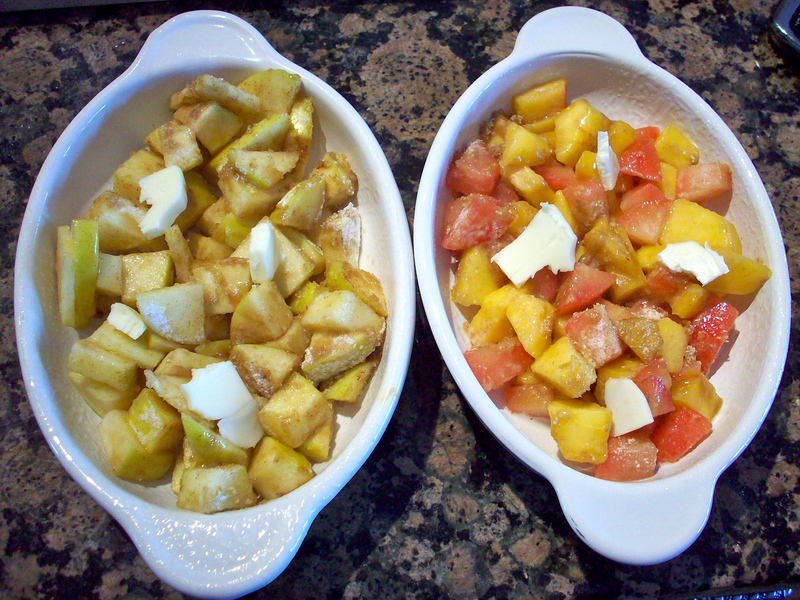 Prepare the two separate fillings by mixing the ingredients together in separate bowls, and set them aside. Chop the walnuts and combine with the oats, sugar, flour, salt and cinnamon. 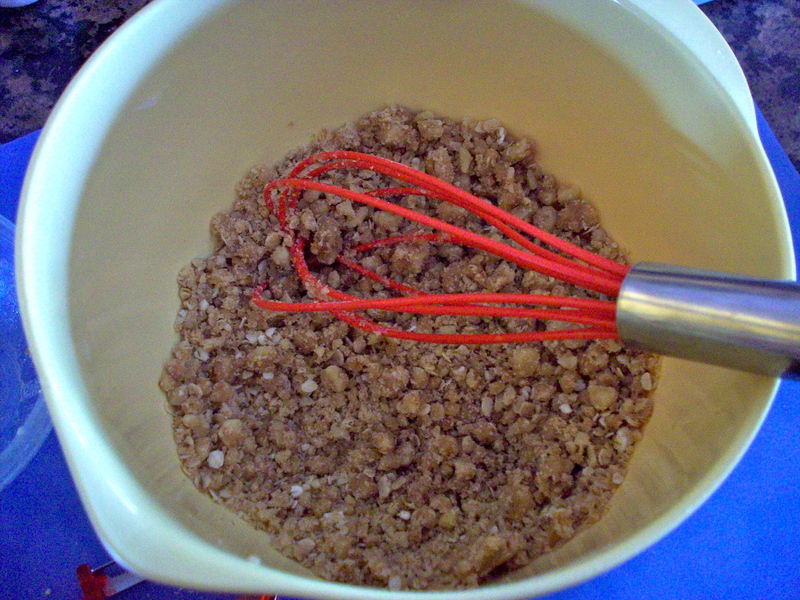 Whisk the butter in until the mixture resembles coarse sand or pebbles. Grease two small baking dishes and add the fillings to each one. 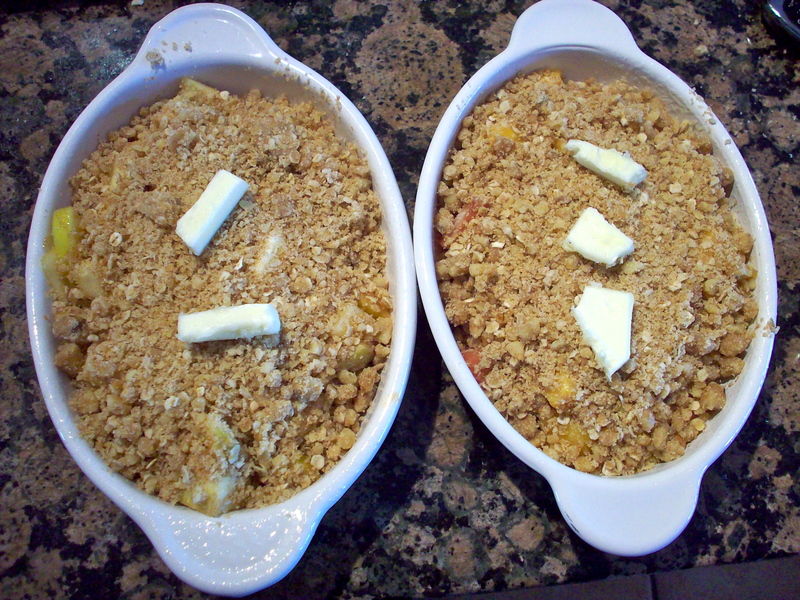 Top each dish with small pieces of butter, followed by plenty of the crumble mixture. 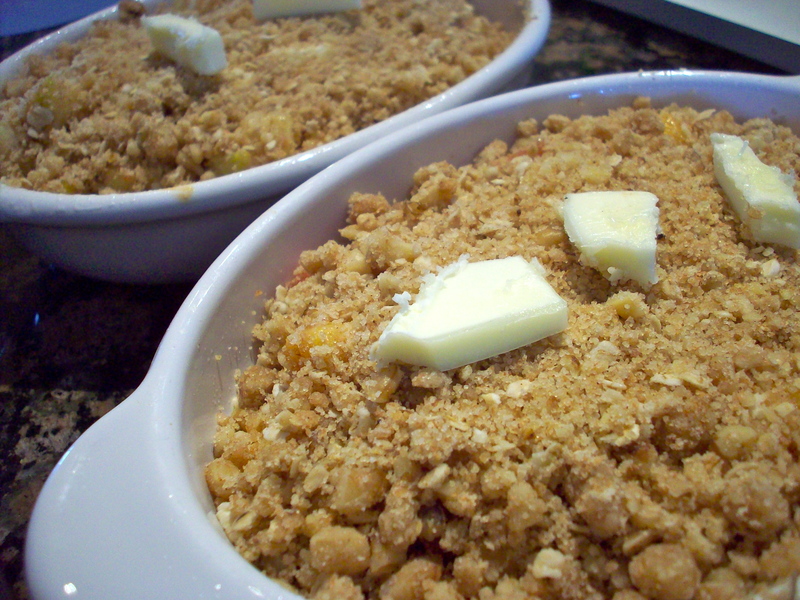 Lastly, top with more small pieces of butter. Bake at 350 degrees for about 20 to 30 minutes. If you would like to turn this into a dessert, you can easily top with vanilla or cinnamon ice cream for quite the treat! 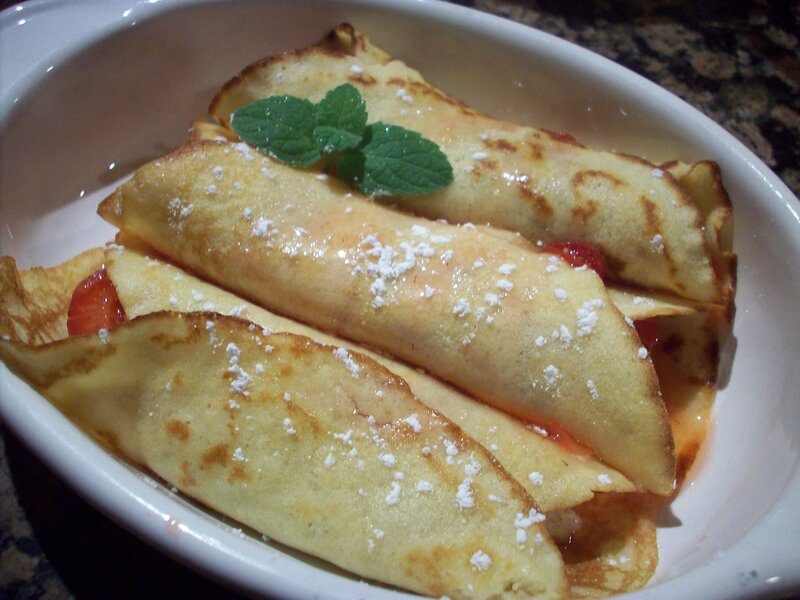 Gluten free crepes made with coconut flour, filled with strawberries and honey. While searching for some flour alternatives to cook for a gluten-intolerant friend, I came across coconut flour. I could smell the sweet buttery scent through the container, and I knew I had to bring it home and experiment. I adore the flavor of coconut flour. It adds a a new level of richness to the crepes. You can make the crepes in advance, without the filling, and separate them with wax paper. If you refrigerate them, be sure to reheat slightly before handling to add the filling. 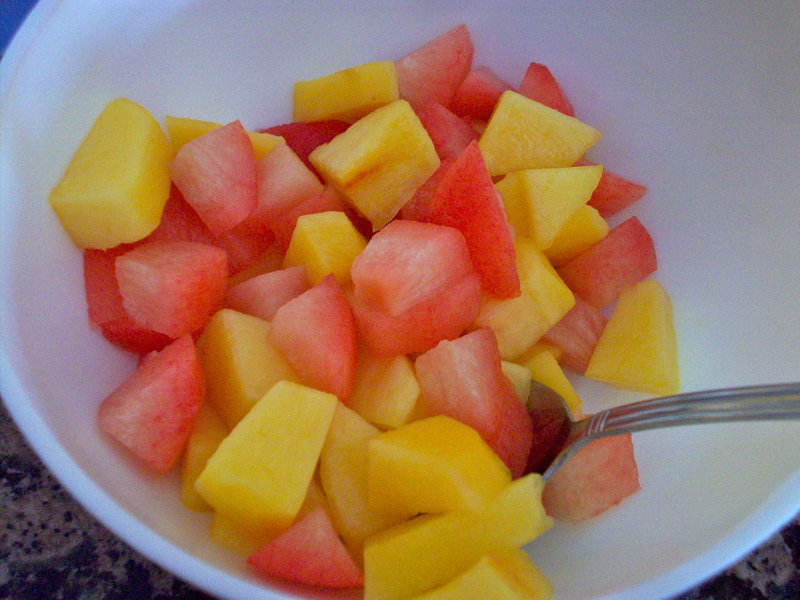 Preferably the day before serving, thinly slice strawberries and combine with honey in a bowl. Cover with plastic wrap and refrigerate (the longer the better, up to 24 hours). Combine eggs, milk, honey, butter and vanilla in a bowl. Slowly incorporate the coconut flour, mixing well to avoid clumps. Over medium-low heat, melt 2 tbsp oil in a skillet. Using aproxamately 1/8 cups of batter at a time, add batter and swirl the pan in slight circles to allow the batter to flatten out. 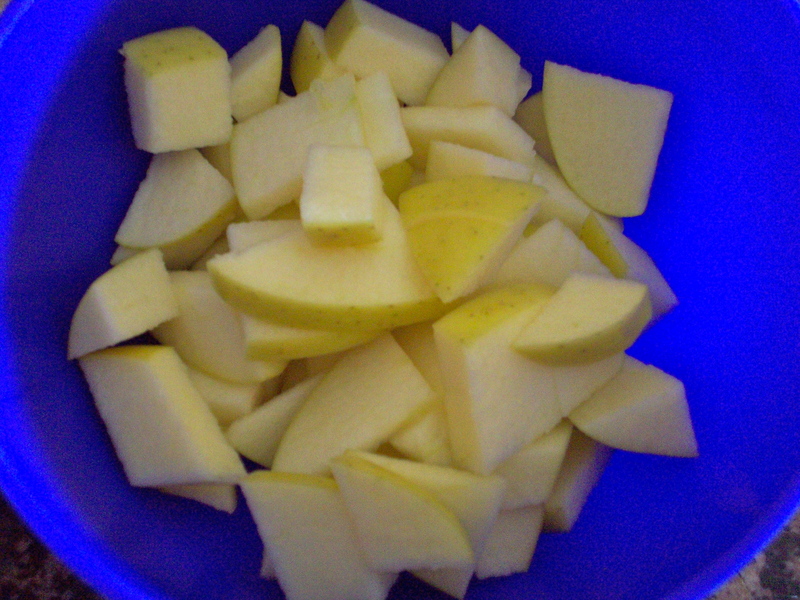 Once the edges appear to have browned, gently flip and cook the opposite side. Separate individual crepes with wax paper on a plate. 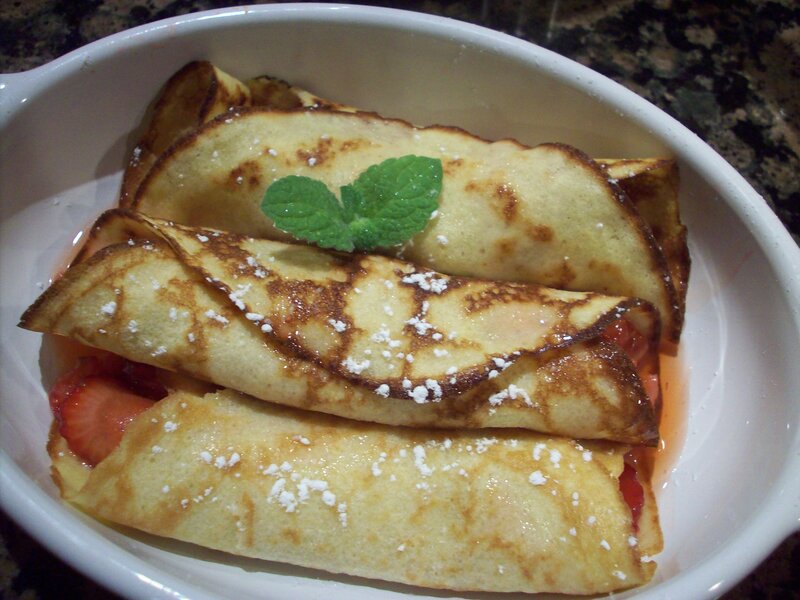 With each crepe, fill with the strawberry mixture and roll. Top with extra strawberries and powdered sugar. Tell me, have you experimented with gluten free coconut flour? If so, what is your favorite recipe?